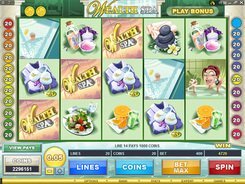 Developed by Microgaming, Wealth Spa is a feature-rich slot with a theme centered on a luxurious spa. 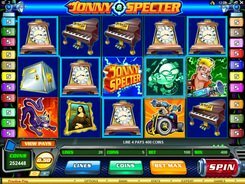 Playing the slot, you can take advantage of scatters, wild symbols, mystery multipliers, free spins, and a host of other amazing features that bring a great combination of entertainment and awards. 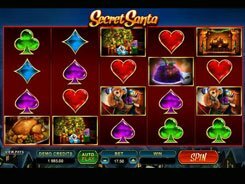 Played over 5 reels and 20 paylines, the slot accepts up to $20 per spin and offers the top jackpot prize worth $5000. 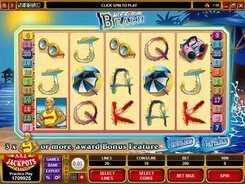 Perhaps the most attractive feature in the slot is five bonus games triggered when you collect a certain number of tokens depicted by a golden ‘W’ coin. One bonus token is awarded if the golden coin appears on the central position of reel 5. To unlock the bonuses you need to collect a different number of tokens. 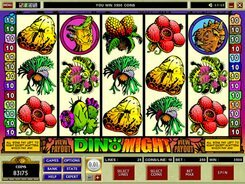 For example, playing Smoothie Bonus where you must pick 4 fruit ingredients for a smoothie requires one token; playing Hot Stone Bonus where you can win mystery multipliers requires two tokens. The last, Massage Bonus is unlocked when five tokens are collected. A great thing about the feature is that Wealth Spa saves your progress, so next time you load the slot you will not have to start collecting tokens all over again. PLAY FOR REAL MONEY!